I can't resist sharing just one more great appetizer to make/bring to a New Year's party, or any party for that matter. 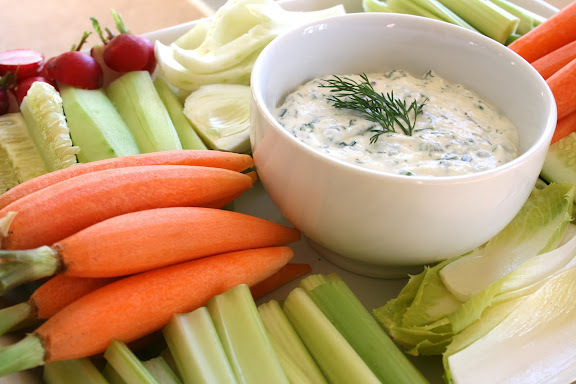 What is appealing about this recipe (besides the fact that it's the best vegetable dip I've ever consumed) is that it halves nicely and you can be creative in your vegetable selection. Whatever you choose, make sure you have a little variety when it comes to shape, texture and color. I used organic carrots (they taste better and come with their pretty, delicate stems attached), radishes, celery, endive leaves, fennel and cucumbers. If you aren't a fan of radishes, a red bell pepper would an excellent substitution. Perfect! I am supposed to bring a dip to our New Year gathering and I wasn't sure what I would make. This sounds very tasty, and your vegetables look so pretty! Thank you! I just made this due to your recommendation. It really is so good. The priciest dip I have ever made, but really yummy. Friends are going to love this tonight. Thanks! I also agree with your nutmeg post...fresh spices make all the difference. I recently treated myself to a jar of smoked paprika that is unlike any paprika I've ever bought off the market shelf.